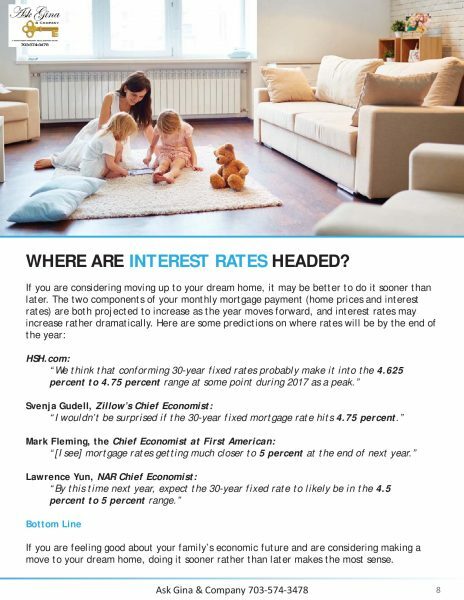 Interest rates are forecast to rise…. Everywhere you turn “they” are telling you that interest rates are going up, your mortgage will cost more, and buying power will be diminished…. Yes, this is all true. However it isn’t as bleak as it appears. Rates are still historically very, very low. Ask anyone who bought in the late 90’s what they think about a rate in the 4’s….you won’t hear them complaining! So what does this mean for a buyer today in Loudoun County? If you plan to make a home purchase in 2017, do it sooner rather than later. Otherwise, all things remain the same. The best things you can do are to save your pennies for a solid down payment, educate yourself on loan options and terms, develop relationships with a trusted lender and real estate agent, and preview the areas you are considering. Don’t worry, the sky isn’t falling.